While I hope you’re enjoying a family cookout and lots of fireworks, it seemed only appropriate to showcase a patriotic red, white, and blue wedding cake today! I love the abstract look of this cake. It’s modern and fun with that all-American vibe thrown in for the holiday. The designs on the cake are created with fondant cut-outs .. which makes it even more impressive! To add a little more pizzazz to the cake, you could always have a cake topper full of sparklers (provided your reception was outside, of course). You can find this cake here. It was created by Confetti Cakes by Elisa Strauss. 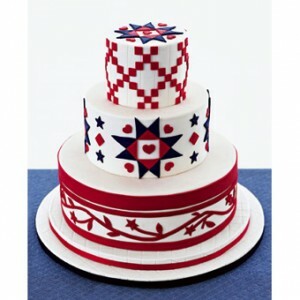 Patriotic Wedding Cake – Red, White, and Blue!